18 April 2019Cathal McConnell Trio at Portobello 27 April! 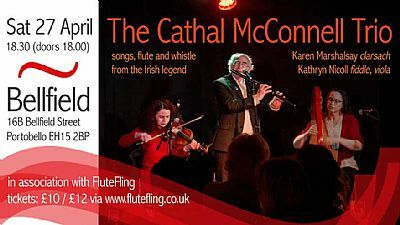 The Cathal McConnell Trio will be playing a family friendly early evening gig at Bellfield in Portobello on Saturday 27 April in association with FluteFling weekend. Tickets are £10/12 and under 10s go free with an adult. The venue is wheelchair accessible. 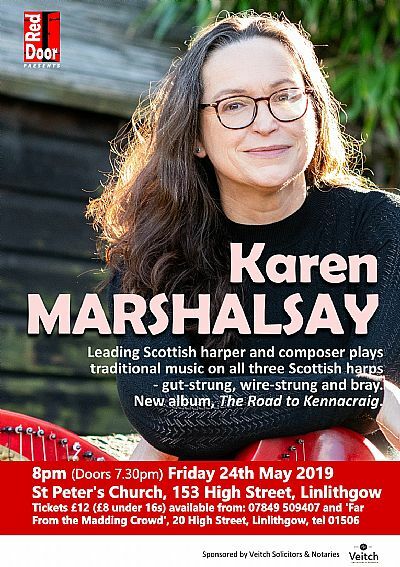 Karen will be doing a solo gig with all three Scottish harps - gut and wire -strung clarsachs and buzzing brays in Linlithgow on Friday 24 May at Red Door - St Peter's Church on the High Street. Our red doors open at 7.30pm, event commences 8pm. Tickets £12/8 available from "Far From the Madding Crowd", 20 High Street, Linlithgow or call 07849 509407. 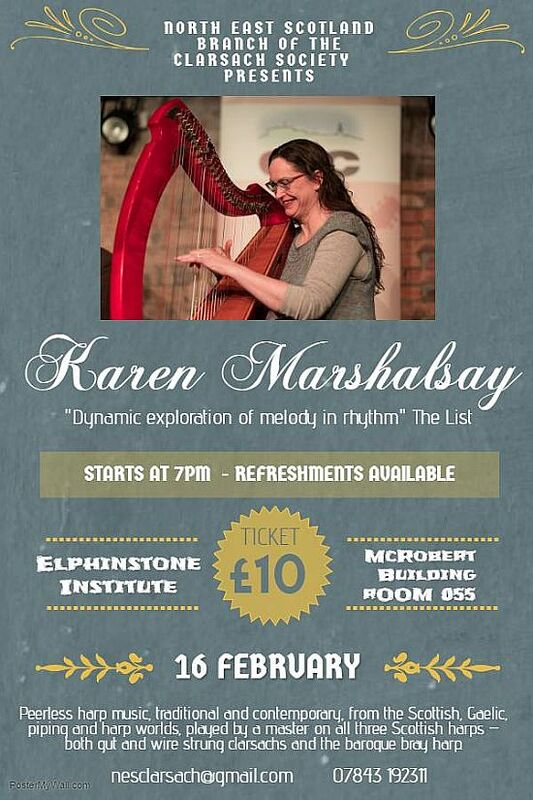 Focusing mainly on Scottish and Gaelic tunes and airs, we will look at music written by Scottish women at various points in history. There are many female tunesmiths and composers working in the traditional scene today but this course will introduce you to the work of those who went before. Essential elements of arranging – harmony, voicings, rhythms and ornamentation will be explored in these new arrangements. Written music will be provided from the start if wished but the course will also be taught phrase by phrase by ear, accommodating all levels of reading and learning styles. The Rivers Centre, Edinburgh which supports people recovering from trauma. Karen will give a solo lunchtime recital on Saturday 10 November 1-2pm for Sphere at RSS in Renfield St Stephen's Church Bath Street Glasgow. No tickets, retiral donations welcome.